After a 30-year career in finance, UNE graduate Matthew Irwin understands all too well the courage it takes to establish a business. "Entrepreneurs are very brave; it requires a big personal commitment, a big family commitment and a big financial commitment to develop an idea and follow your passion," said the senior executive and director. "But if these businesses are successful, they employ people, encourage investment and help grow regions. We need to continue to find ways to invest in innovation and entrepreneurs, especially in our regional cities, or else we'll continue to have an exodus of smart young people to the cities." It is this belief in regional development, and dedication to the New England and North West, particularly, that has seen Matthew devote considerable time to supporting UNE's SMART Region Incubator (SRI). As chairman of the SRI's advisory committee, he is generously sharing his expertise and connections with its startup founders. "I benefitted greatly from my education at UNE (a Bachelor of Agricultural Economics), as well as the friendships I formed living in college (Robb College, from 1982-85) and growing as an individual and developing resilience," Matthew said. "I'm pleased to now be giving something back, especially given I also own a beef farm in Armidale." 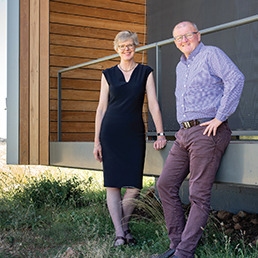 Launched in March 2017, with support from the NSW Department of Industry, the University of New England and the Armidale and Tamworth Regional Councils, the SRI aims to support emerging businesses and grow innovation and jobs in the Armidale and Tamworth regions. Forty-three startups that have joined the SRI have already created 19 jobs and attracted investment of just over $2 million in the fields of agtech, agribusiness, health, social enterprise and regional business solutions. "Being part of our network, benefitting from the mentoring of our experts-in-residence and access to UNE researchers gives founders a safe and inspiring place to grow their ideas and enterprises," said SRI director Lou Conway. "We're dedicated to upskilling founders and enabling them to follow their idea through to a successful launch. People like Matthew, with international experience and strategic networks, can help our founders to extend their opportunities beyond the region and even into parallel sectors. the SRI are Edwina Sharrock, founder of Birth Beat - an online platform that provides childbirth education. Edwina has pitched Birth Beat to investors and stakeholders at the HCF Catalyst Demo Day and appeared on the television show Shark Tank, where she secured funding of $200,000. The startup founders are the real heroes and they need support. I urge others with valuable experience to engage with the SRI because it is ultimately about community. By supporting the SRI, I feel that I am supporting something that may directly or indirectly benefit my community in the future. The SRI is also working with students who are either already working on their startup or plan to be developing an idea for market as part of their degree program. Please join the SRI team on social media to follow the students and startups as they build their business at @unesmartri on Facebook and Instagram. If you’d like to find out how you or your business can get involved, contact Lou Conway at the SRI. If you would like to find out more about how you can support UNE contact Kate Hadfield in the Office of Advancement, Communications and Events. Find out more about the UNE Smart Region Incubator here.